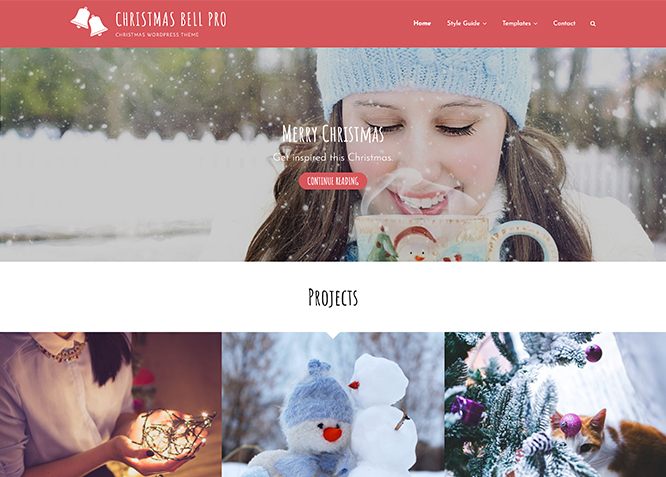 Christmas Bell Pro is a Christmassy Multipurpose WordPress theme that will give your website a warm and welcoming look and feel of Christmas. Christmas Bell Pro solely focuses on providing your website a festive look with its vibrant color palette. The theme is creative and polished, has a charming look, and requires absolutely zero coding knowledge to customize. It is completely responsive, and your website will look beautiful on all devices. 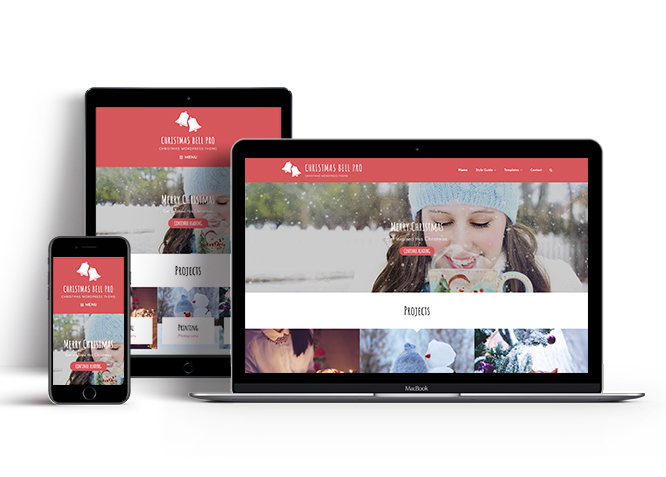 Christmas Bell Pro provides you with a plethora of awesome features such as, custom logo, header media option, menus, breadcrumb, featured content, featured slider, hero content, layout options, pagination options, portfolio, service, testimonials, widgets, and more. With all these incredible features, you can create a pleasant website of any kind with a welcoming Christmassy look. This theme is translation ready. For more details check out the Theme Instructions. You can customize this theme using cool additional features through Customizer at "Appearance => Customize" from your WordPress Dashboard. You can customize this theme using cool additional features through Customizer at "Appearance => Customize" from your WordPress Dashboard. Christmas Bell Pro supports 4 featured slider types they are: 1. Post , 2. Page, 3. Category and 4. Custom. For Featured Slider Options, go to "Appearance => Customize => Theme Options =>Featured Slider". Christmas Bell Pro supports 5 featured content types to choose from: 1. Post, 2. Page, 3. Category and 4. Custom. 5.Tags (via Jetpack) For Featured Content Options, go to "Appearance => Customize => Theme Options => Featured Content". Christmas Bell Pro supports 4 Hero Content types to choose from:1. Post , 2. Page, 3. Category and 4. Custom. For Hero Content Options, go to "Appearance => Customize => Theme Options => Hero Content Options". Christmas Bell Pro has 2 Site Layout, 4 Default Layout, 4 Homepage/Archive Layout, 4 Archive Content Layout, 3 Single Page/Post Image Layout and 4 Woocommerce Layout options image layout to choose from "Appearance => Customize => Theme Options => Layout Options"
Once you are in Layout Options, you can Check the option below "Default Layout" which will set your site's default layout. Once you are in Layout Options, you can Check the option below "Archive Content Layout" which will set your site's content layout. 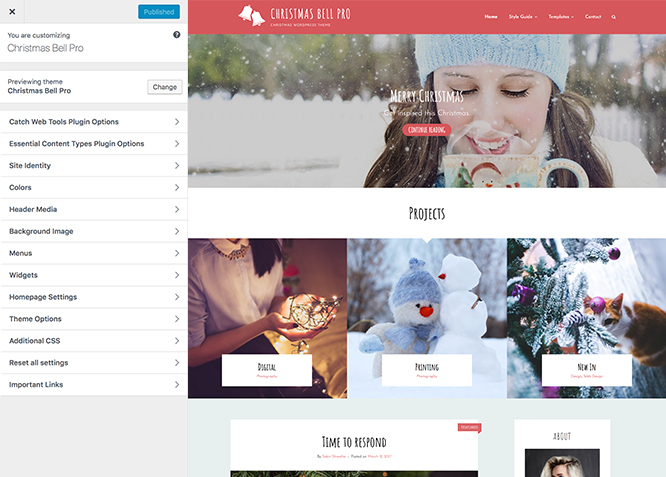 Christmas Bell Pro supports Page, Post, Category, Custom and Custom Post Type as Portfolio. Christmas Bell Pro supports 5 Services types to choose from: 1. Post , 2. Page, 3. Image, 4. Category and 5. Custom Post Type. Personal Trainer Pro supports 5 Testimonial types to choose from: 1. Post , 2. Page, 3. Custom, 4. Category and 5. Custom Post Type. Christmas Bell Pro offers exciting Menu Options! This theme supports and recommends using "Custom Menus". You can create Custom Menu through "Appearance => Menus" from your WordPress Dashboard. #How to add Featured Content using Essential Content Types? #How to add Services in Homepage/Frontpage using Essential Content Type? Christmas Bell Pro currently has 17 widgetized (Sidebar) areas thay are: 1. Sidebar, 2. Instagram, 3. Footer One, 4. Footer Two, 5. Footer Three, 6. Footer Four, 7. Content Bottom 1, 8. Content Bottom 2, 9. WooCommerce Sidebar, 10. 404 Page Not Found Content, 11. Optional Homepage Sidebar, 12. Optional Archive Sidebar, 13. Optional Page Sidebar, 14. Optional Post Sidebar, 15. Optional Sidebar One, 16. Optional Sidebar Two and 17. Optional Sidebar Three Go to "Appearance => Widgets" or "Appearance => Customize => Widgets" in WordPress. You can add widgets to your widget area from two location1. Go to "Appearance => Widget", then drag the widget to the widget area or you can click in the widget then list of widget area will appear, now you can choose desired widget area and click on "Add Widget". 2. Go to "Appearance => Customize => Widgets", then you can find list of widget area. Click on the any widget area and you will see "Add a Widget" option by click on it you can find list of Widget which you can add to respected widget area. #How to add Instagram Widget in Sidebar?